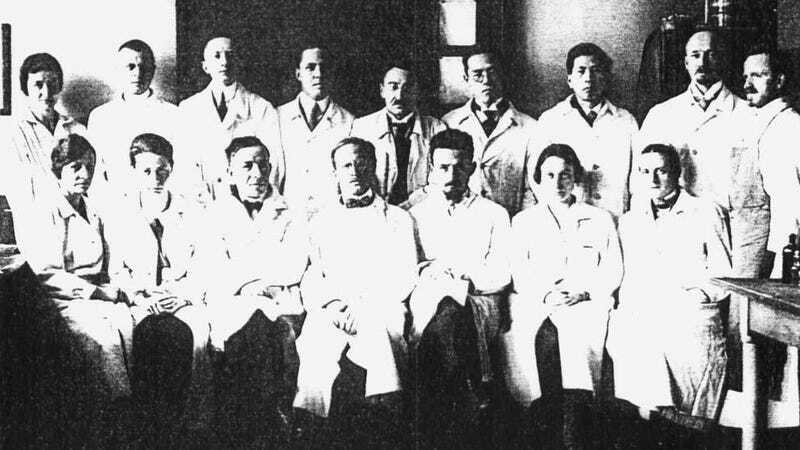 Julius Hallervorden’s research group before the war. He’s top row, second from left. Dozens of brains and brain parts belonging to victims of the Nazi eugenics campaign—and possibly the Holocaust—have been uncovered during renovations at the Max Planck Psychiatric Institute in Munich, Germany. The grim discovery was made in the spring of 2015, prompting the Max Planck Society to launch a thorough investigation of its specimens collection. Surprisingly, Israeli media have only recently picked up on the story. According to the Max Planck Society, the rediscovered samples, which include 100 brain preparations from 35 cases, belonged to the estate of the doctor and brain researcher Julius Hallervorden (1882-1965). A member of the Nazi party, he became head of the Neuropathology Department of the Kaiser Wilhelm Institute for Brain Research in 1938 (today it’s known as the Max Planck Institute for Brain Research). Before, during, and after the Second World War, Hallervorden knowingly performed research on brain samples extracted from executed prisoners and those deemed mentally deficient. Given that the KWI regularly received samples from Josef Mengele—the notorious concentration camp doctor—it’s entirely plausible that Hallervorden also experimented upon the remains of Jewish Holocaust victims. For decades, the Max Planck Society had no qualms about using these unethically sourced samples for its research, but things changed in the late 1980s owing to political pressure. By 1990, most of its labs had disposed of samples collected between 1933 and 1945, but it now appears that this purging process is still incomplete, much to the MPS’s embarrassment. The samples, which contain both microscopic brain slides and “wet” specimens, were discovered during renovations last year, much to the surprise of Germany’s leading psychiatric institute. An investigation is currently underway to review all samples at Max Planck facilities, and to identify the remains and manner of death where possible. Those who were victims of the so-called “euthanasia” campaign will be buried with names in a mass grave. It’s not known if the newly discovered samples were exclusively derived from the Nazi euthanasia campaign, i.e. the deliberate murder of patients with intellectual disabilities, mental illnesses, and genetic disorders, or if they were collected from other sources, such as the death camps.